Chipsbank umptool v5.00 can repair and format corrupted Chipsbank CBM209x controller .Download chipsbank umptool v5 and repair Chipsbank CBM2093A1, CBM2093P, CBM2095, CBM2096, CBM2096P, CBM2193A1, CBM2193P chip controllers . Hello my friends , today i will explain how to repair corrupted Chipsbank USB flash drives .Chipsbank umptool v5.00 has been designed for formatting Chipsbank Controller with the following chip part numbers " Chipsbank CBM2093A1,Chipsbank CBM2093P, Chipsbank CBM2095,Chipsbank CBM2096,Chipsbank CBM2096P,Chipsbank CBM2193A1,Chipsbank CBM2193P, Chipsbank 2093A1P,Chipsbank 2095, Chipsbank 2096,Chipsbank 2096P,Chipsbank 2193A1P . Chipsbank CBM209x umptool can reformat chipsbank flash drives that have format errors such as write protection error ,Windows unable to format disk ,please insert disk error message , no media 0 byte raw file system ,Flash capacity is less than the normal maybe you find it 8MB or or 15MB or 128MB and other format issues . Chipsbank CBM umptool v5 support updating the firmware of the chip controllers that we mentioned before also support formatting flash drive with VID =1e3d , PID = 2095 . Please don't use this software with another chip controller ,you must determine your flash drive chip first , you can use Chipgenius software or USBDeview V2.30 utility . Download Chipsbank umptool v5.rar from download links below . Insert corrupted chipsbank flash disk to your PC . 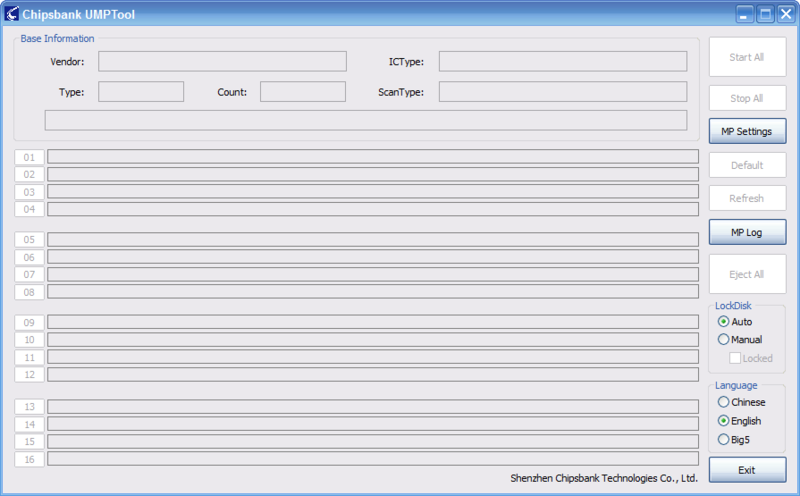 Extract Chipsbank umptool v5.00.rar and open chipsbank umptool v5.exe . IF your flash drive controller supported by this software , you will see flash information appears on the software . To start updating flash firmware click Start All but note that all data inside USB flash drive will be erased . Thanks, for your site & helpful chip software.. I broke mine, But learnt something upon the way..